“God wills it.” With that arrogant assertion in 1095, Pope Urban II launched the First Crusade. That led to the Second, of course, and the Third, and so on; several hundred years later The Crusades finally came to an end, having taken a toll of at least a million dead. Beyond those tragic consequences, they also “succeeded” in congealing the hatred and mistrust between Christians and Muslims and Jews that continues to this day. If you like your humor extremely dark, though, The Crusades furnish some historical incidents and characters that are worthy of a Monty Python sketch. Consider Peter Bartholomew, whose fifteen minutes of infamy occurred during the First Crusade. During the struggle to secure Antioch in 1098, the peasant Peter went to the Bishop of LePuy and reported that he had been having visions of St. Andrew, who had revealed to him the hiding place of a sacred relic. It was, according to Peter Bartholomew, the lance that had been used to pierce the side of Christ on the cross. That was greeted by some with skepticism, but at this point the siege of Antioch had been going on for months. The crusaders, who by now were reduced to boiling their saddles for food, were anxious for a little uplift. 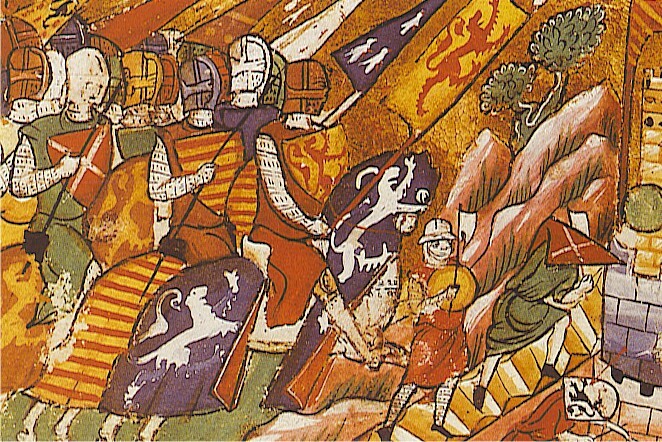 A group led by the knight Raymond of Toulouse went to the cathedral and started digging into the floor, where the visionary Peter had said the lance could be found. After several hours of digging hadn’t turned up the lance, Peter Bartholomew himself climbed down into the hole and by golly, he managed to fairly quickly find the lance down in that pit. Following that triumph, his visions came frequently and he was consulted often in his role as spokesman for St. Andrew. Morale of the troops was jacked up by this pipeline to heaven, and not long afterward, Antioch was safely in the crusaders’ hands. Historians attribute that to bad political decisions made by the emirs on the battlefield, but at the time, the rank-and-file crusaders were giving most of the credit for the victory to the good omen of Peter Bartholomew’s sacred lance. Within months, however, an epidemic had broken out in Antioch, the leadership was badly divided and battlefield successes had become few and far between. Peter Bartholomew’s credibility was waning; some cynics even suspected that Peter had planted that sacred lance in the floor of the cathedral himself. He needed to do something dramatic to restore his reputation. It’s not clear who came up with the idea for the test of Peter Bartholomew’s divine connections, and maybe he was deluded enough to think he could pull it off. In any case, he agreed to an ordeal by fire. A gauntlet of olive branches, stacked four feet high and about one foot apart was constructed. It was lit on fire, and Peter — carrying the sacred lance — walked through the flames and staggered out the other side. An eyewitness report states that “his tunic and the holy lance, which was wrapped in the most exquisite cloth, were left unsinged”. The same couldn’t be said for Peter himself. He was mobbed by the crowd as he completed his fiery walk, and many of them grabbed burning sticks to keep as relics of this “miracle”. Peter died a few days later from what we now call third-degree burns. What became of the lance? Raymond of Toulouse kept it for a while and led his troops with it, but after that the provenance gets hazy. It supposedly went to Paris for enshrinement in Sainte-Chapelle along with the Crown of Thorns, but disappeared during the French Revolution. Currently, the Sacred Lance is in several places: there’s one in Vienna’s Hofburg palace, another in the Vatican, one in Krakow, Poland and yet another in Armenia. For all I know the Sacred Lance may also be on eBay right now. I haven’t had any visions about that.